How Do We Colonize Venus? Welcome back to our series on Colonizing the Solar System! Today, we take a look at Earth’s “sister planet”, the hellish, yet strangely similar planet Venus. Enjoy! Since humans first began looking up at the skies, they have been aware of Venus. In ancient times, it was known as both the “Morning Star” and the “Evening Star”, due to its bright appearance in the sky at sunrise and sunset. Eventually, astronomers realized that it was in fact a planet, and that like Earth, it too orbited the Sun. And thanks to the Space Age and numerous missions to the planet, we have learned exactly what kind of environment Venus has. With an atmosphere so dense that it makes regular surface imaging impossible, heat so intense it can melt lead, and sulfuric acid rain, there seems little reason to go there. But as we’ve learned in recent years, Venus was once a very different place, complete with oceans and continents. And with the right technology, colonies could be built above the clouds, where they would be safe. So what would it take to colonize Venus? As with other proposals for colonizing the Solar System, it all comes down to having the right kinds of methods and technologies, and how much are we willing to spend. Since the early 20th century, the idea of colonizing Venus has been explored in science fiction, mainly in the form of terraforming it. The earliest known example is Olaf Stapleton’s Last And First Men (1930), two chapters of which are dedicated to describing how humanity’s descendants terraform Venus after Earth becomes uninhabitable; and in the process, commit genocide against the native aquatic life. By the 1950s and 60s, terraforming began to appear in many works of science fiction. Poul Anderson also wrote extensively about terraforming in the 1950s. In his 1954 novel, The Big Rain, Venus is altered through planetary engineering techniques over a very long period of time. The book was so influential that the term term “Big Rain” has since come to be synonymous with the terraforming of Venus. All told, most proposed methods for colonizing Venus emphasize ecological engineering (aka. terraforming) to make the planet habitable. However, there have also been suggestions as to how human beings could live on Venus without altering the environment substantially. For instance, according to Inner Solar System: Prospective Energy and Material Resources, by Viorel Badescu, and Kris Zacny (eds), Soviet scientists have suggested that humans could colonize Venus’ atmosphere rather than attempting to live on its hostile surface since the 1970s. At an altitude of 50 km above the surface, the environment has a pressure of approximately 100,000 Pa, which is slightly less than Earth’s at sea level (101,325 Pa). Temperatures in this regions also range from 0 to 50 °C (273 to 323 K; 32 to 122 °F), and protection against cosmic radiation would be provided by the atmosphere above, with a shielding mass equivalent to Earth’s. The Venusian habitats, according to Landis’ proposal, would initially consists of aerostats filled with breathable air (a 21:79 oxygen-nitrogen mix). This is based on the concept that air would be a lifting gas in the dense carbon dioxide atmosphere, possessing over 60% of the lifting power that helium has on Earth. These would provide initial living spaces for colonists, and could act as terraformers, gradually converting Venus’ atmosphere into something livable so the colonists could migrate to the surface. One way to do this would be to use these very cities as solar shades, since their presence in the clouds would prevent solar radiation from reaching the surface. This would work particularly well if the floating cities were made of low-albedo materials. Alternately, reflective balloons and/or reflecting sheets of carbon nanotubes or graphene could be deployed from these. This offers the advance of in-situ resource allocation, since atmospheric reflectors could be built using locally-sourced carbon. In addition, these colonies could serve as platforms where chemical elements were introduced into the atmosphere in large amounts. This could take the form of calcium and magnesium dust (which would sequester carbon in the form of calcium and magnesium carbonates), or a hydrogen aerosol (producing graphite and water, the latter of which would fall to the surface and cover roughly 80% of the surface in oceans). NASA has begun exploring the possibility of mounting crewed missions to Venus as part of their High Altitude Venus Operational Concept (HAVOC), which was proposed in 2015. As outlined by Dale Arney and Chris Jones from NASA’s Langley Research Center, this mission concept calls for all crewed portions of the missions to be conducted from lighter than air craft or from orbit. The benefits of colonizing Venus are many. For starters, Venus it the closest planet to Earth, which means it would take less time and money and send missions there, compared to other planets in the Solar System. For example, the Venus Express probe took just over five months to travel from Earth to Venus, whereas the Mars Express probe took nearly six months to get from Earth to Mars. In addition, launch windows to Venus occur more often, every 584 days when Earth and Venus experience an inferior conjunction. This is compared to the 780 days it takes for Earth and Mars to achieve opposition (i.e. the point in their orbits when they make their closest approach). Compared to a mission to Mars, a mission to Venus’ atmosphere would also subject astronauts to less in the way of harmful radiation. This is due in part to Venus’ greater proximity, but also from Venus’ induced magnetosphere – which comes from the interaction of its thick atmosphere with solar wind. Also, for floating settlements established in Venus’ atmosphere, there would be less risk of explosive decompression, since there would not be a significant pressure difference between the inside and outside of the habitats. As such, punctures would pose a lesser risk, and repairs would be easier to mount. In addition, humans would not require pressurized suits to venture outside, as they would on Mars or other planets. Though they would still need oxygen tanks and protection against the acid rain when working outside their habitats, work crews would find the environment far more hospitable. Venus is also close in size and mass to the Earth, resulting in a surface gravity that would be much easier to adapt to (0.904 g). Compared to gravity on the Moon, Mercury or Mars (0.165 and 0.38 g), this would likely mean that the health effects associated with weightlessness or microgravity would be negligible. In addition, a settlement there would have access to abundant materials with which to grow food and manufacture materials. Since Venus’ atmosphere is made mostly out of carbon dioxide, nitrogen and sulfur dioxide, these could be sequestered to create fertilizers and other chemical compounds. CO² could also be chemically separated to create oxygen gas, and the resulting carbon could be used to manufacture graphene, carbon nanotubes and other super-materials. In addition to being used for possible solar shields, they could also be exported off-world as part of the local economy. Naturally, colonizing a planet like Venus also comes with its share of difficulties. For instance, while floating colonies would be removed from the extreme heat and pressure of the surface, there would still be the hazard posed by sulfuric acid rain. So addition to the need for protective shielding in the colony, work crews and airships would also need protection. Second, water is virtually non-existent on Venus, and the composition of the atmosphere would not allow for synthetic production. 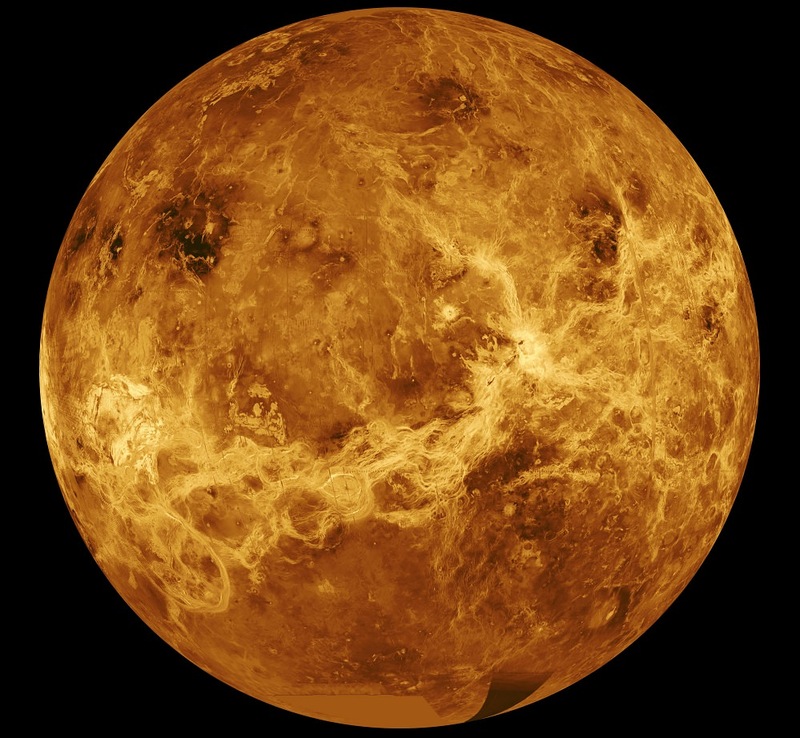 As a result, water would have to be transported to Venus until it be produced onsite (i.e. bringing in hydrogen gas to create water form the atmosphere), and extremely strict recycling protocols would need to be instituted. And of course, there is the matter of the cost involved. Even with launch windows occurring more often, and a shorter transit time of about five months, it would still require a very heavy investment to transport all the necessary materials – not to mention the robot workers needed to assemble them – to build even a single floating colony in Venus’ atmosphere. Still, if we find ourselves in a position to do so, Venus could very become the home of “Cloud Cities”, where carbon dioxide gas is processed and turned into super-materials for export. And these cities could serve as a base for slowly introducing “The Big Rain” to Venus, eventually turning into the kind of world that could truly live up to the name “Earth’s sister planet”. M.J. Way et al. “Was Venus the first habitable world of our solar system?“, Geophysical Research Letters. D. Arney, C. Jones. “HAVOC: High Altitude Venus Operational Concept – An Exploration Strategy for Venus“, NASA Technical Reports Server, Langley Research Center.